Have you ever sent an SMS on your phone via Hyperterminal or called someone on phone straight from Hyperterminal? You might ask: why the fuss? Well like me, you might need to do a project that requires automation of some phone actions (like calling or sending feedback SMS) or you just want to do everything from the Terminal. 1. Make sure you get a phone that can understand AT commands, not all phones can. 2. Get the data cable for the phone, be it serial or USB cable. 3. 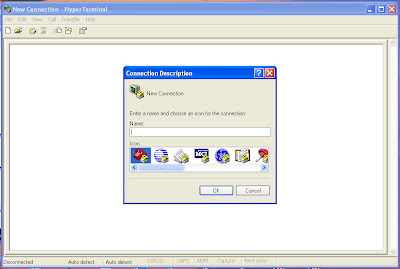 Make sure you have a serial/com terminal communication tool like the popular Hyperterminal that comes with windows XP or the free to download ones like putty, kermit and tterm. 4. Got to device manager on the windows OS ( for Linux users, please request me to give you the procedure as it is quite cryptic) and check under ports for the com port allocated to your data cable. 5. Run the terminal communication software, indicate the communication port, choose '8' data bits, parity 'None', 1 and handshake 'none', baudrate '9600' and stop bits '1'. 6. When the terminal indicates connected, enter 'at' (without the quotes), you must get an OK reply. 7.You will need to enter 'at+cmgf=1', to put the phone in data mode and not the default pdu (protocol data unit, an hexadecimal mode) mode, this is important if you want to send or read SMS using AT commands. 8. The following are the basic at commands you will need to read messages, send messages, place a phone call,end a call and get firmware information. These commands with work on most phones that allow AT commands. If you desire to do additional stuffs not implementable with the commands above, you can use the Google search to search for the list of AT commands supported by your phone. Thanks for checking out my blog. Look around on the top right for posts you may benefit from, and click to subscribe and receive useful tips via e-mail.